The Stranger has a featured article by Jonah Spangenthal-Lee on the issue of graffiti and the cleanup of it here in the city. Hardest hit areas are Capitol Hill, University District and recently the Central District. Below are a few choice excerpts from the read. DV One even has a quote. Click here for the full house. Every year, the city spends $1.25 million on graffiti cleanup—and that's just for city-owned property. (Private business owners are required to clean their own property.) 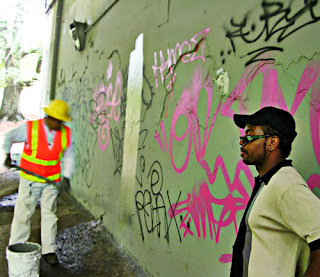 In 2006, the Graffiti Rangers cleaned up 300,000 square feet of graffiti in Seattle, only to see it pop back up days—and sometimes hours—later. According to one SPD officer who deals with graffiti—and asked not to be named—the city isn't doing much to stop it. "We don't have a graffiti unit in the Seattle Police Department," he told me. "Nobody's out there looking for graffiti thugs. We're out there looking for drug dealers [and] prostitutes." The officer estimates his precinct only makes a dozen graffiti arrests every year. "When graffiti started, there was a higher standard," says Toby Campbell, better known as Seattle DJ DV One. He's something of a local graffiti historian. He remembers seeing it in Seattle as far back as 1984. "Back in the day it was hiphop cats. Now you have hipsters running around tagging stuff." In Campbell's opinion, the city's fresh-coat-of-paint solution may actually be encouraging graffiti by providing writers with fresh canvases. He said, "Doesn't that just invite people to do it again?"